It’s a legitimate writing class exercise to ask new writers to write about the ordinary — to elevate, inspire, observe, to counter the downward pull of the overexposed and unprepossessing. Considering how much of the world fits that category (hence the label InsideTheOrdinary), most of the similes are too readily available and the easy analogies frozen into monochrome. 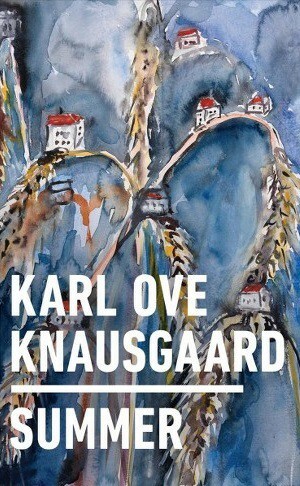 One is sympathetic when reading that when Karl Ove Knausgaard was working on a passage about slugs, he was distracted by reading a few book reviews of his earlier work — including one calling his earlier Spring a “poetic mummy blog.” This thread-breaking is not dissimilar to the challenges facing readers. The rough outline of the project is both similar and different from the diarist / blogger frame. There is the occasional timestamping (which is rarely salient), as well as self-exhortation to reveal and to tease out insight from surroundings, utterances, facts. Because this overt self-discipline is essential to writers, this is an oft-repeated theme for “thinking aloud.” It can also become routine. To a banana fly, life is like a duty watch. When its watch is over, someone else takes its place. What the banana flies are watching over is what once brought them across from the other side, that shadow of life which the possess and which lives on in others when they themselves are swallowed up in vinegar and return to being motes of dust. In part, the entertainment within Summer is the juxtaposition of the ordinary, sometimes prosaically mapped, with erudition and patience. The erudition will deter some, and fascinate others who will be put off by the recitations of ordinary. Be prepared to encounter Swedenborg, Charlie Chaplin, Homer, Charles the Twelfth, Ovid. In about six hours you will wake up, cheerful and contented, ready for a new day in which nothing of what awaits you will surprise you. Originally published at insidetheordinary.com on February 5, 2019.